Kauai is the fourth largest of the Hawaiian Islands with a land area of 533 square miles. It is 33 miles long and 25 miles across at its widest point. It is the oldest of the major Hawaiian islands, at 5.8 million years old. As of the 2010 U.S. Census: 68,745. Ethnic mix: 33.6% Caucasian, 20.4% Filipino, 9.9% Japanese, 8.8% Native Hawaiian, 1.6% Chinese. 20% mixed (two or more races). Kauai has traditionally been called the "Garden Isle." More recently it has also been called "Hawaii's Island of Discovery." Lihu'e Airport is the main airport providing passenger and aircraft facilities for domestic and overseas carriers, inter-island carriers, commuter/air taxi, air cargo, and general aviation activities. Port Allen Airport is located one mile southwest of the town on Hanapepe on the south shore of Kaua'i. This is a general aviation airport with a single runway. Princeville Airport is a private airport located 3 miles east of Hanalei on the north shore of Kaua'i. Agriculture (coffee, taro, papaya, guava) Kaua'i produces more than 60% of Hawaii's taro, which is more than five million pounds a year. The average daily temperature is 70°F - 80°F. The trade winds provide cooling fresh air and rain showers are brief in the early morning and evening. Average precipitation is 41 inches. Miles of Shoreline - 113 of which 63 miles is accessible. Number of Beaches - 69 Kaua'i offers more beach per mile of coastline than on any of the other Hawaiian Islands. Over 50% of beaches are white sand beaches. Parks - There are 8 state parks, 67 county parks and community centers and no national parks. Highest Peak - Kawaikini Peak reaches an elevation of 5,243 feet, followed by Mt. 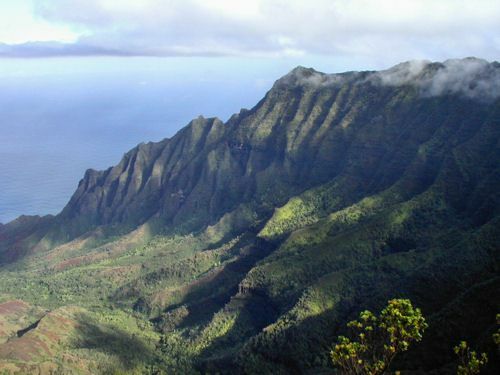 Wai'ale'ale at 5,052 ft. Mountainous terrain occupies the north, west and central part of the island. For more information view our feature on Kauai's top golf courses. There's no island in Hawaii better for adventure on land, sea and in the air than Kaua'i. Ocean adventures include charter fishing, dolphin encounters, scuba and snorkel, whale watching or just cruising beneath the stunning green palisades of the Nā Pali Coast. You can travel in a power boat, rubber zodiac, sea kayak, or smooth gliding catamarans. Additional ocean activities include surfing, water skiing and windsurfing. The only navigable rivers in Hawaii flow through Kauai. Paddlers can explore placid river reaches by kayak. Less ambitious travelers can go up the Wailua River to the Fern Grotto by boat with Smith's Fern Grotto Wailua River Cruise. You'll be treated to Hawaiian music along with way and one of two hula dancers swaying. Hiking trails head into Waimea, the "Grand Canyon of the Pacific," or along the Nā Pali Coast to breathtaking valleys unreachable by road. There are coastal hikes across high sand dunes, and rain forest treks among the oldest flora in Hawaii. Explorers can also choose mountain bike tours, explore the wilds riding all-terrain-vehicles or take a zipline adventure. Horseback riding will take you into forests, canyons and mountains for picnics, waterfall swims and beautiful ocean vistas. Kauai is a movie lover's paradise. More than 75 Hollywood features have been filmed on Kauai and Hawaii Movie Tours® or a Polynesian Adventure Tours Ali'i Movie Excursion will take you in an air-conditioned van equipped with video screens so you can watch clips from films such as ​Jurassic Park while gazing at the green valley where the T-Rex prowled. If you're going to take a helicopter tour of any of the Hawaiian Islands, Kauai is my top pick. So much of the island's beauty can only been seen from the air. Check prices for your stay on Kauai with TripAdvisor.